In traditional South African communities, music forms the pivotal core around which the community is structured and dance is used to bind the community. The Drum Cafe team will teach the group the dance form of your choice. Interactive dance is wonderful as a finale to interactive drumming and boomwhacking or can be an entire team-building event on its own. Our team will teach your group basic dance routines, and within a few minutes you will be dancing together and having fun. As guests enter the venue, they are welcomed with a dance performance by a group of dancers on stage, and whilst everyone is being seated a Zulu King enters to loud cheers and praises from the dancers on stage. The King welcomes everyone to his village and his praise poet praises the king and the gathering. (With a clear brief from you, this praise poetry can be tailored to refer to your event). The King explains that celebration is a communal affair and requires that everyone add not only their voices, but also their bodies to the occasion. An interactive dance session of around 20 minutes follows, in which the dancers teach the audience a series of fun, simple steps, building up into a sequence with a hot ending. 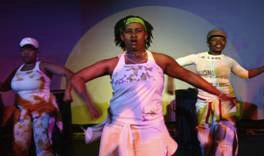 If desired, the dancers can then perform five-minute choreography as a finale. 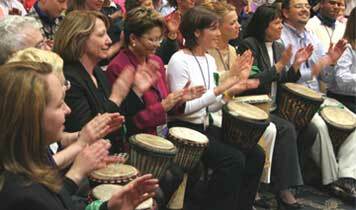 Interactive clapping is ideal for very large groups of people and is also an ideal finale to Interactive Drumming. Our team will teach basic clapping rhythms to your group, which come together to make a beautiful sound. Participants either clap their hands or use clapping sticks. The Drum Cafe drummers begin by setting the mood with an explosive drumming performance. The facilitator then divides the audience up, teaching each section a unique rhythm. Each section do their own clapping rhythm, which comes together beautifully to form an uplifting composition. The Drum Cafe team custom-make unifying corporate rhythms, and tailor the overall feel of the rhythm to the culture of the company. Or, we can teach your employees the very trendy Rhythm of the Nation, created by Drum Cafe for the IMC, using drumming, gumboot dancing, boomwhacking, dance and/ or clapping. Always wanted to wear a spotty and flash your new All Stars? Now is your chance! 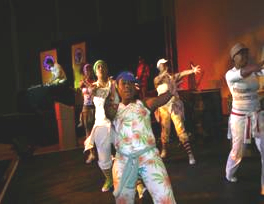 Drum Cafe’s Interactive Kwaito Experience is a pulsating 30 – 40 minute dance and DJ show that brings the audience into the world of the township street bash: its dance moves, chanting, rapping and beats. This is an unforgettable experience that really rocks your group. Brush up on your dance floor technique, learn to rap and rhyme and get your group into the pulse of the people now, Mzantsi style. This unique interactive experience includes a DJ, rappers and dancers and is a fun-filled South African experience. The Drum Cafe team arrive approximately an hour before the starting time for set up and sound check. The show combines numbers performed by the dancers and numbers that involve the audience. As the audience enters the room, they are met with an inviting kwaito pulse. The show starts off with a pumping group dance, soon the dancers begin to involve the audience. With a repertoire of clapping and dance moves they get the participants to join in with simple kwaito steps, body percussion and chants. As the session progresses, within a short time, your group will be getting down dancing and rapping together in a kwaito bash. motivating a group. Content can be tailor-made to your company message. The show includes an exciting and athletic soccer number to tie in with events that are affiliated to 2010 and the Confederations Cup. Remember to read about Interactive Drumming, Interactive Gumboots, Interactive Boomwhacking.